THE SUPERHEROIC PERVERSION OF THE DECADE - NOW IN AN OVERSIZED HARDCOVER EDITION! At one time, Butcher Baker was the preeminent, All-American superhero. Now hes... getting laid. A lot. But one last mission could signal his return to glory, and now hes back on the blacktop! Its a balls-out, pimp-slappin, surreal super-epic from the twisted minds of JOE CASEY and MIKE HUDDLESTON! 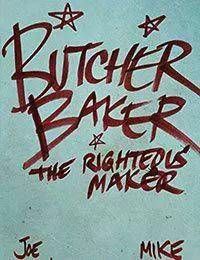 LOADED WITH ALL-NEW BACKMATTER MATERIAL!Collects BUTCHER BAKER, THE RIGHTEOUS MAKER 1-8.